The Dow 20,000 or Bust? 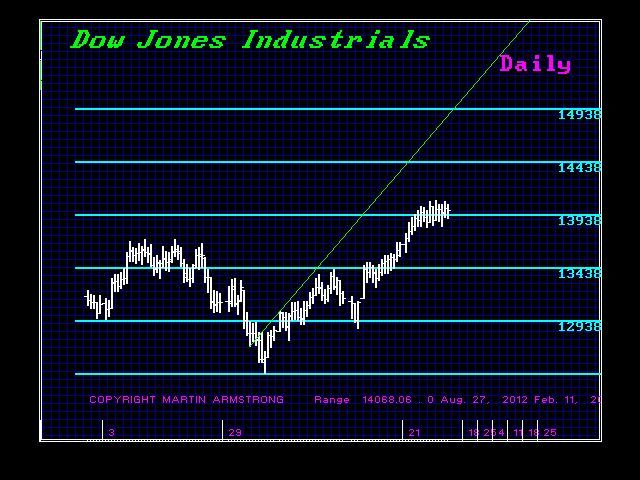 The Dow Jones Industrial Index has been pressing against the 2007 high, but we still need a monthly closing ABOVE 14280. Actually, we face rising volatility in March and April. As we approach the ECM target date of August 7th, 2013, we will need some caution. If we obtain a monthly closing ABOVE 14280 soon, then we can see a blast to new highs by that time for you see that will also be 51.6 months from the 2009 low. Projected resistance by then stands at 15790, 15965, 16976, 17303, and 20295. Support lies at 13745. First you would expect a rally into the mid 15000 zone, a retest of support back at the 14280 level, and then a rally into the July time period. Depending on the strength of such a rally, the picture thereafter will change significantly. The high we move, the harder the fall. The less drastic the rally, the more base-building we will see and that means we are in a staging formation for a high much later on. So we still need to watch 14280 on a monthly closing basis. No worries – there is no basis for the revisitation of a 1929 scenario. For that to happen, capital would have to run to government bonds. Right! That is a good one! We will be focusing on these monumental events at the Princeton Conference March 18-19.